Have you been dreaming of a wedding day for the history books? Then you may want to consider a South Carolina location known for history, horses, and hospitality. 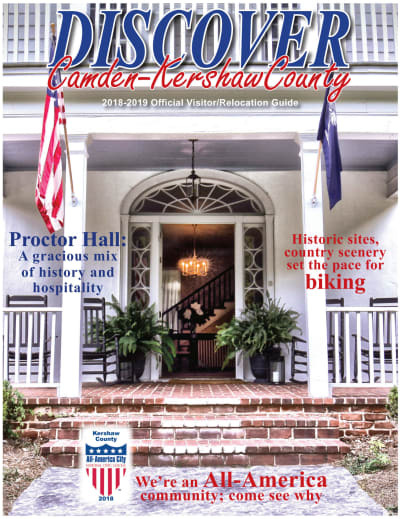 Picturesque Camden, SC, the state's oldest inland city, located in Kershaw County, may just be the destination of your dreams. Canopies of live oaks and magnolias, laced with dogwoods, accented with a myriad of azaleas and camellias, welcome you and your guests to Camden's shady streets. If you're looking for historic charm in a tranquil setting, this could be the ideal spot for your ceremony, festivities or honeymoon. The Camden Historic District is home to more than 60 sites pre-dating 1865. Stately antebellum estates to charming nineteenth century cottages greet visitors as they drive, stroll, or take a carriage ride through this area. The bride and groom may even want to engage a horse-drawn carriage for a romantic ride from ceremony to reception. Wedding and reception sites, featuring handsome interiors plus beautiful gardens and lawns, may provide the fulfillment of your dreams. You may say your vows, or entertain your guests in locations ranging from an English garden behind the reconstructed Revolutionary War home of Camden's founder; in a gazebo on the lawn of an antebellum house; in a renovated 1825 courthouse designed by Robert Mills, America's first professional architect; or at the top of a galleria overlooking downtown Camden. Antebellum to twentieth century churches of various denominations are among other choices.